Angel Tree: Angel Tree is a program designed to help provide Christmas assistance to children ages birth to 12. Mr. Bingle Silver Bells: Silver Bells is a program designed to help provide Christmas assistance to seniors ages 65 and up. Sorry, program is closed for the year. Check back in October 2019 for application dates. Help spread the holiday cheer! 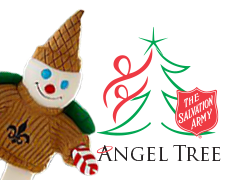 The Salvation Army is in need of volunteers to help with our Angel Tree and Mr. Bingle Silver Bells programs. Volunteers will sit at a table inside Lakeside Mall assisting those interested in adopting an ‘Angel’ or ‘Mr. Bingle’. Duties include providing interested parties with a card representing the Angel(s) or Mr. Bingle(s) that they wish to adopt. (Information on the card will include: the Angel or Mr. Bingle’s Christmas wish list as well as clothing / shoe size). Volunteers will also help collect and keep track of the Christmas gifts that are brought back to the table. Please contact our Volunteer Coordinator, Linda Hall, at (504) 504-373-5563 or email for available shifts and to sign up (volunteers must sign up in advance). Volunteers must be 18 years of age or above unless accompanied by a parent or guardian. This is also a great way for students to complete their service hours for school!